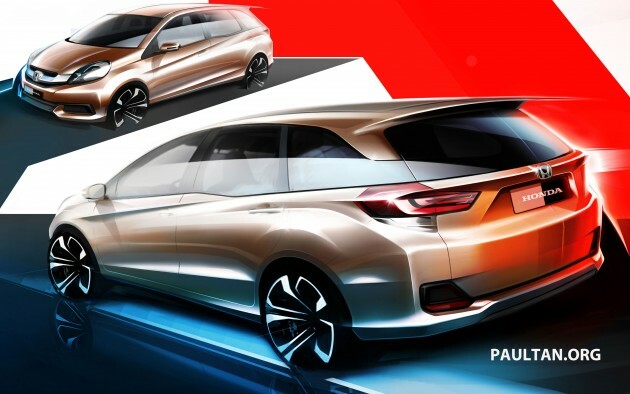 We’ve previously seen a sketch of Honda’s upcoming Brio-based budget MPV that’s set to be unveiled at this year’s Indonesian International Motor Show, but today we can show you leaked low res photos and Indonesian market variants for the car revealed by Indonesian site Autonet Magz. UPDATE: More details and live IIMS 2013 gallery of the Honda Mobilio MPV here. The MPV is rumoured to be called the Honda Mobilio, a name that was previously used for a JDM compact MPV with sliding doors before it was eventually replaced by the Honda Freed. Unlike the more upmarket Freed which uses sliding doors, the Brio-based Honda MPV comes with conventional doors. The dip in the rear door window line that appeared on the sketches goes to production. These leaked slides, which you can click to enlarge, show the availability of a manual gearbox for the basic S and E models as well as a CVT for the top of the range E model, instead of a torque converter automatic gearbox. This is quite interesting because the Indonesian spec Brio hatchback uses a five-speed auto instead of a CVT. The MPV will be powered by a 1.5 litre engine, likely to be the same one in the City and Jazz. This unit “provides both sporty performance and good fuel efficiency” according to Honda. It will come with seven seats in a three-row configuration, the segment norm. Rivals that are waiting include the Toyota Avanza and Daihatsu Xenia twins, Suzuki Ertiga and the Chevrolet Spin, among others. The MPV will be the first product of Honda’s new RM1.05 billion second plant in Karawang Industrial Park, scheduled to begin operation in early 2014.
by the way, im amazed the can make a 7 seater out of brio.. It stated the engine is 1.5 laa… Alza n avanza can..y this cannot? The designer must be frustrated. What he/she drew and what Honda made looks totally differrent. If I were that designer, I would resign on 24-hour notice and migrate to the other side of the world. And perhaps start a new life as a farmer instead. This is nothing short of blasphemy, an embarrassment to the Honda brand. It won’t habis, it actually creates new market and opponent for Toyota. OMG…now the current new Avanza already habis liao…less sales compared the old 1. Alza already beaten it. it’s the electric motor that helps the acceleration more..
Honda, we want the one in the sketch, not the avanza look-alike. Yes you will get it……. 1.5 on 7 people will strugle on acceleration. But not a problem for hill like genting. 1.3 avanza full load climb hill on 2nd gear like truck. It able to climb. Just slower. A & X will lose …. AX at indonesia like a tin. The watermark kind of get in the way of the car, need to reserve final judgment for the styling when the car is announced at Indonesia Motor Show later this month. The 2 speakers are peculiar, I wonder if there are an extra pair of speaker housing so this car owners can install better surround system. Kind of wondering if the car is going to use the new L15B that powers the 3rd gen Fit… 132ps is more than enough… even the old 7 seater Stream has only 125ps and I find it quite tantalizing to drive. Gosh! It looks nothing like the concept drawing but instead so much similarity to the Toyota Avanza! My opinion is the Avanza looks way better especially the front! Honda should have made a jazz-based MPV just like the airwave. now that’s a looker. The sketch is damn nice, the one in slides is a let down.. better than or worse than Freed? it really looks no different to Avanza, what a shame to honda. ask your designer go Toyota to learn how to design first. Honda. The power of dreams. But in this case, it’s the power of BAD dreams.